ALS is characterized by a progressive loss of both lower motoneurons (spinal cord and brainstem) and upper motoneurons (motor cortex) leading to severe paralysis and death, generally caused by respiratory failure or cardiac arrhythmias. “Amyotrophic” refers to the muscle atrophy, weakness and fasciculation meaning disease of the lower motoneurons. “Lateral sclerosis” refers to the hardness of palpation of the lateral columns of the spinal cord in autopsy specimens, where gliosis follows degeneration of the corticospinal tracts. The estimates of disease incidence in the United States are ~ 2 per 100,000 persons per year. Amyotrophic lateral sclerosis prevalence is 20% higher in men than in women. Between 5–10% of ALS patients have a family history of this disorder, usually related to autosomal dominant inheritance, and out of these, 15-20% are linked to mutations in the superoxide dismutase (SOD1) gene. 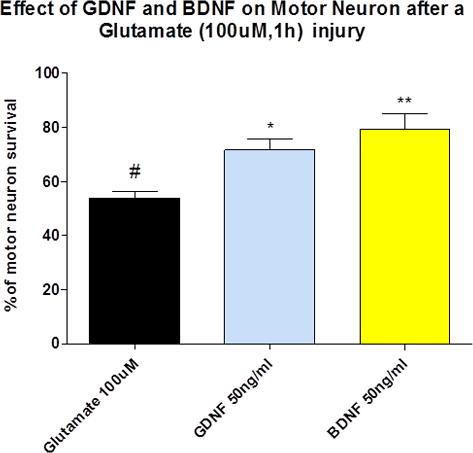 Several studies have shown increased levels of glutamate in the cerebro-spinal fluid, brain and serum of patients with ALS. 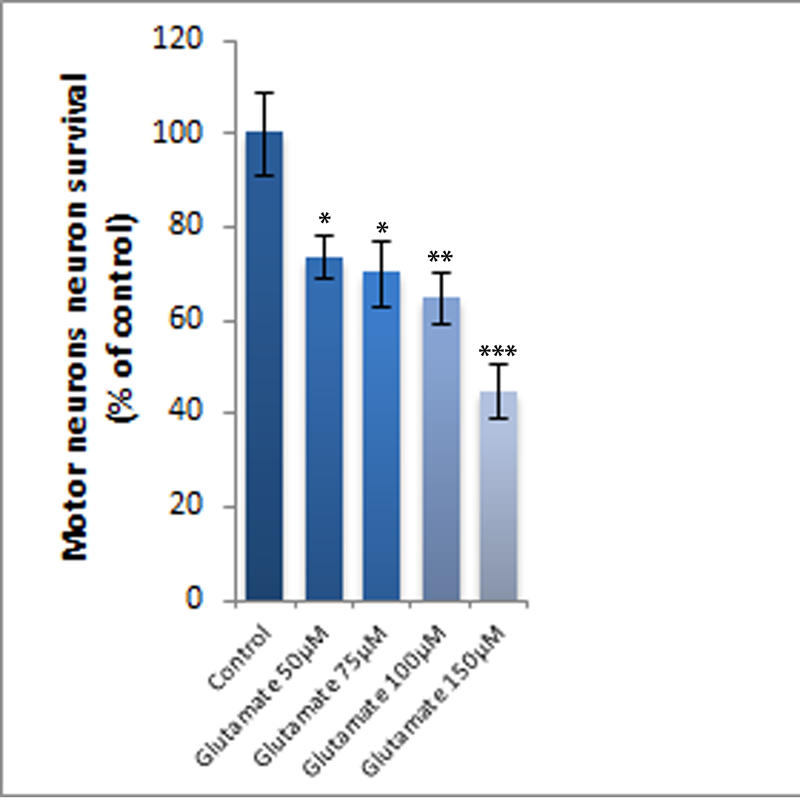 These patients also have reduced clearance of glutamate from motor control areas as well as decreased levels of glutamate transporter-1 protein, leading to an excess of glutamate. 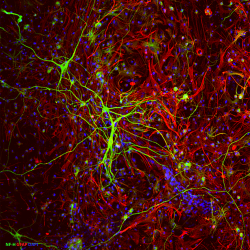 It is likely that these and other cellular perturbations all contribute to motoneuron death ultimately involving apoptosis. 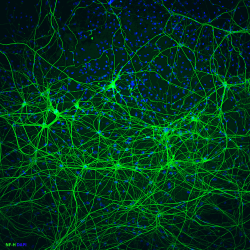 Riluzole (Rilutek®), an inhibitor of glutamate transmission is the only pharmaceutical agent currently licensed in the United States and Europe for the treatment of ALS. Its efficacy is limited and only prolongs survival by approximately 3-6 months. Thus, there is a clear need for novel therapies to prevent disease progression and eventually even reverse motoneuron loss. 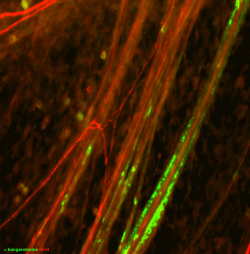 Neuromuscular junction (labeled with α-bungarotoxin) in the model of motor neuron / muscle co-culture.